Let’s just get this out of the way up front: this cornbread is not what you’d serve alongside ribs, chili, or fried chicken. 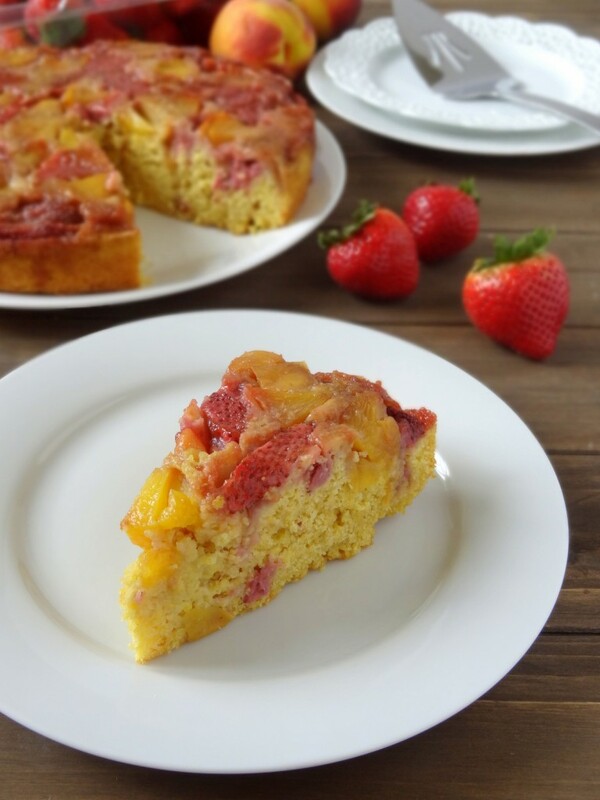 It could very well be what you’d serve afterward, though, because this strawberry peach upside-down cornbread cake—whew, what a mouthful, huh?—belongs solidly in the dessert category. Or possibly brunch. In my mind, there’s only a fine line between dessert and brunch: if it doesn’t have frosting, it’s fair game at any time of day (and sometimes even if it does!). 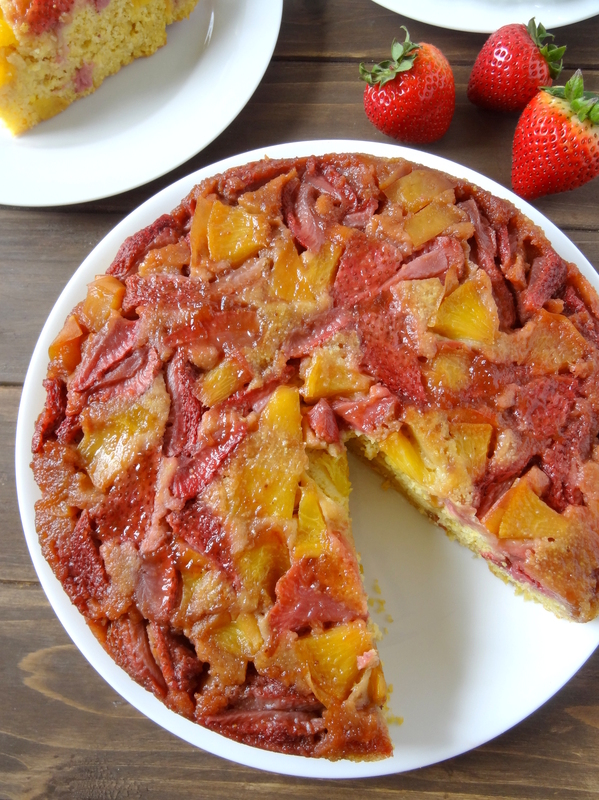 At first, I was going to call this a “strawberry peach cornmeal upside-down cake,” but then I was afraid that might be a tad misleading. You see, this cake is literally a cornbread recipe combined with an upside-down cake topping (fruit/butter/sugar). Have you ever tried Trader Joe’s cornbread mix? That’s where I originally got this idea—that stuff is so good, I’ve actually eaten it for dessert. So while this cornbread cake is definitely more dessert-y than side dish-y, it also has a wonderfully rustic feel: just a touch of sweetness, a subtle coarseness, and a lightness that is perfect for disgustingly humid balmy summer evenings. A note about timing: while this cake still tastes great after a day or two, it looks best on day one, so if you are making this for company, I recommend making it the same day you’ll be serving it. I baked mine in the evening and took pictures the next day, and its appearance had already changed somewhat overnight. Preheat the oven to 375 degrees. Place the 3 tablespoons of margarine for the topping in a 9-inch round pan (preferably with 3-inch sides) and heat in the oven until melted, about 3 minutes. After removing the pan from the oven, coat the sides with cooking spray. Sprinkle 1/2 cup brown sugar evenly over the melted margarine, and arrange the fruit on top in a single layer (as much as possible). In a bowl or glass, combine the almond milk, almond milk yogurt, and lemon juice, and stir together with a fork until smooth. Let the mixture sit at least 5 minutes before incorporating it into the other ingredients. In a mixing bowl, whisk together the flour, cornmeal, baking powder, salt, and baking soda. Set aside. In a separate bowl, combine the maple sugar, brown sugar, eggs, and vanilla extract. Whisk together until smooth, and then stir in the almond milk mixture. Gently fold the wet ingredients into the dry. Once combined, add the melted margarine and fold until incorporated. Pour the batter into the pan on top of the fruit and smooth the top until level. Bake for 30-35 minutes, until the cake is golden and an inserted toothpick comes out clean. Let the cake cool for 10 minutes before running a knife around the edges and flipping onto a plate. I use 2 cups strawberries and 1 cup peaches, but feel free to use whatever ratio you prefer. 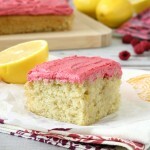 If you are not concerned with keeping this cake dairy-free, you may replace the almond milk, almond milk yogurt, and lemon juice with 3/4 cup buttermilk. Ohhh… two of my favorite things! I absolutely LOVE upside down cakes and who doesn’t like cornbread?! I never thought of combining the two together though, that is totally creative… love it! Thanks! I love using cornmeal and fruit together in desserts, and figured, heck, why not do a full-fledged cornbread?! This looks really really good! 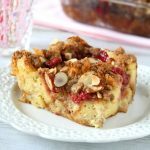 Love the combination of the fruit and the cornmeal-based cake!!! Where’s the whipped cream???!!!! Thanks! The sweet fruit and savory cornmeal complement each other so well. I thought about topping it all off with some whipped cream, but ultimately decided I wanted to keep this dessert completely dairy-free. I’m sure it’d make a lovely finishing touch, though! Almost vegan (but dairy-free!) – I haven’t yet delved into the realm of vegan egg substitute experimentation! 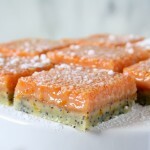 I was thinking that this would be a good 4th of July dessert…maybe toss in some blueberries for a more patriotic look? Let me know what you think if you try it! Love meeting other CA-born food bloggers! 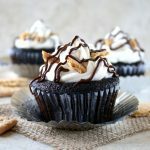 Just stumbled upon your blog, and this looks delicious. I’d eat it for the main course and dessert! 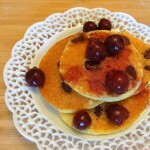 I’m so glad you found my blog, and thanks for saying hello! Thank you! I hope you do! Wow – this looks divine! This looks really tasty! Love that it’s been tested out with dairy-free ingredients. Thanks! While I could never give up things like cheese or ice cream, I do try to keep my own baked goods dairy-free whenever possible. Yum!!! 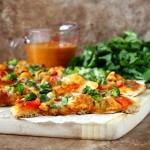 This combines all of my favorite things – I will definitely give it a try!! Thanks for sharing! I hope you like it as much as we do! Thanks for stopping by! This looks delicious! I love fruit with cornbread. With it being peach and strawberry season, this is definitely going on my list of things to try! This cake is beautiful! Love the strawberries and peaches! So yummy! 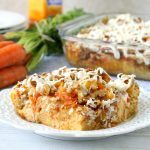 This sounds amazing, the cornmeal is such a good idea!! Thanks! I’m glad it caught your eye! 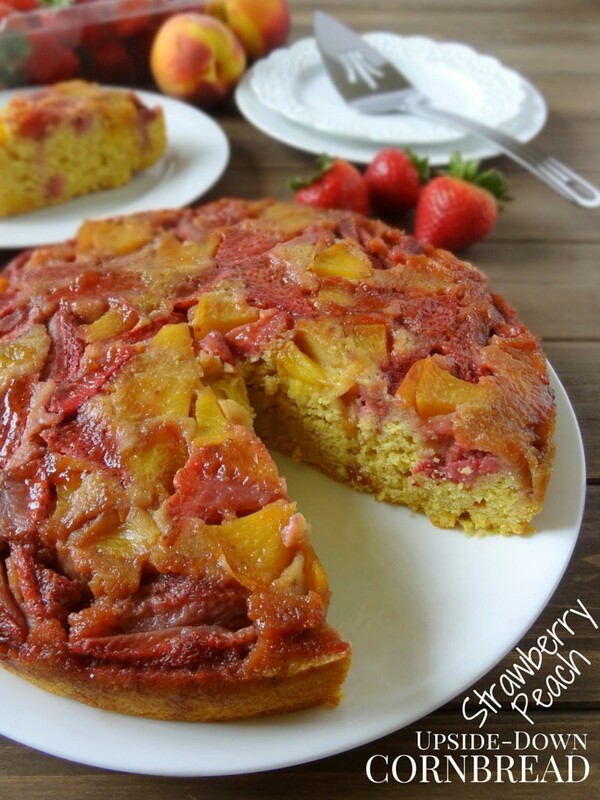 I love fruit with cornbread and this looks delicious! 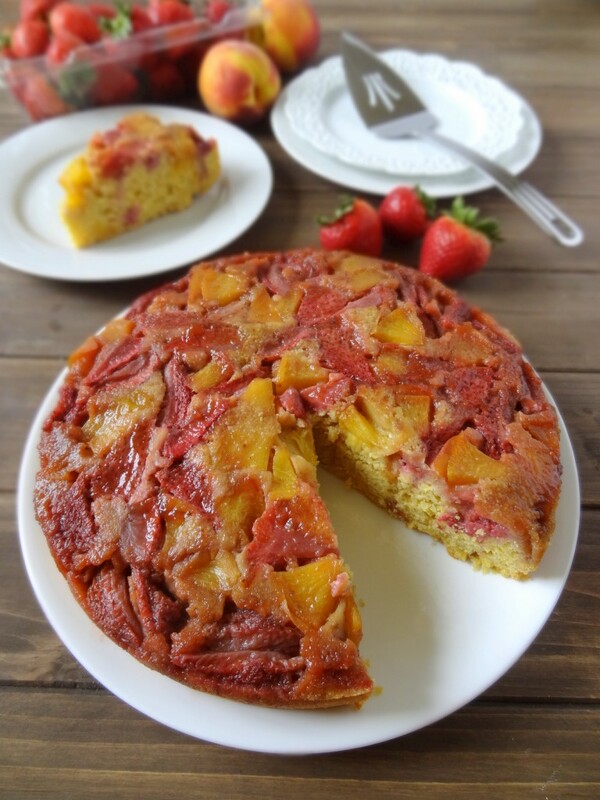 Love the combo of strawberries and peaches – just lovely! Thanks! 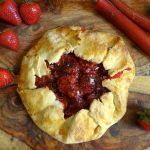 I could eat strawberries and peaches for days on end without getting tired of them! What a great looking dessert. I have not made fruit with cornbread but will be giving it a try. Not sure why I havn’t because a I make a sweet cornbread all the time. Happy FF! Thanks, and a belated happy Fiesta Friday to you as well! Oh, wow, this looks wonderful!! 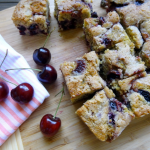 I haven’t thought about mixing cornbread with fruits, what an excellent idea!! Thanks for bringing this to Fiesta Friday! What a beautiful cake! 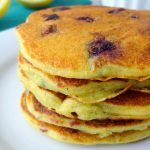 I’ve not thought to use cornmeal like this but it sounds wonderful! Thank you! I like to use cornmeal to keep cakes (and coffee cakes) from being overly sweet. This looks so pretty and sounds delicious as well. Funny enough, I just say some corn and peach (or maybe it was plum, I’ve forgotten already) in a nearby cafe and thought they sounded good, but this sounds even better! Thanks for sharing with Fiesta Friday. I LOVE cornmeal and fruit. I can practically taste your cake through your photos! YUM! This looks delicious! All of my favorite things in one dish, thanks for sharing! Thanks! I’m glad to hear it caught your eye!